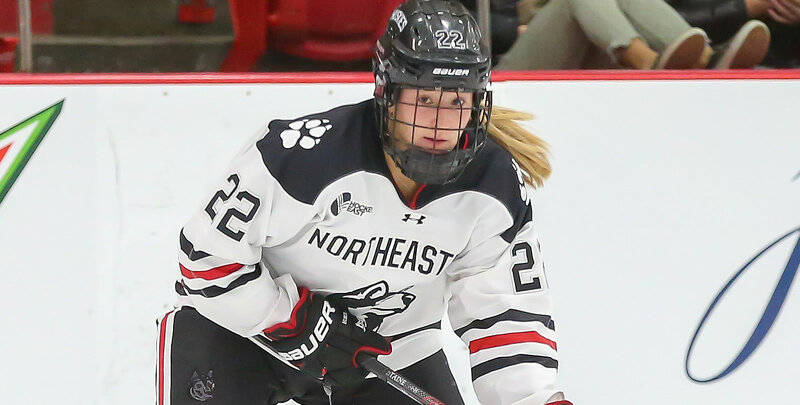 STORRS, Conn. - Despite a valiant effort, the UConn women's hockey team dropped a 4-1 decision to the Huskies from Northeastern on Saturday afternoon at the Freitas Ice Forum. UConn falls to 13-11-1 on the season, while Northeastern improves to 17-3-3. The road Huskies got off to a hot start, tallying three goals in the opening period to take a commanding 3-0 lead into the first intermission. Northeastern tacked on an early goal in the second to push its lead to 4-0. UConn didn't bow down though - after coming out more aggressively, the home team was finally able to cash in on one of its 13 shot attempts, as freshman Danika Pasqua found the back of the net to cut into the deficit. UConn continued its aggressive play in the third period, firing seven more shot attempts. Despite their competitiveness, the home team was unable to find the back of the net and the three-goal deficit proved to be too much to overcome as UConn fell, 4-1. The Huskies from Northeastern struck for the game's first goal just past the midway point of the first period. Skylar Fontaine raced down the ice and used a stick deke to gain a slight advantage on Morgan Fisher and scored at 11:02 to give the visitors a 1-0 lead. Northeastern doubled its lead to 2-0 at 18:15 after Andrea Renner redirected Codie Cross' shot from center point. The visitors took a 3-0 lead after a Kasidy Anderson shot was blocked out by Fisher, but took an unlucky bounce off a UConn player into the back of the cage. A short-handed goal from Tessa Ward made it 4-0, visitors, at 3:55. UConn ramped up its attack in the second period, firing 13 shots at Northeastern's netminder Aerin Frankel, and was finally able to light the lamp at 16:01 and carve into the deficit. Taylor Wabick whipped a pass over to freshman Danika Pasqua, who then raced down the left side of the ice and fired a mistle just under the glove of Frankel, into the bottom right corner of the cage to bring UConn within 3, 4-1. Third period was an up and down, fast paced affair despite only 12 combined shots. Of those 12 attempts, seven were from the Huskies of UConn but the home team couldn't find the back of the net in the final period. Morgan Fisher recorded 5 saves in the period to keep Northeastern from adding any more points to its lead.